My Mom is a teacher. Although officially an “administrator” now, I still think of her as a teacher, who just happens to have graduated to an adult-size chair. As my kids got older and I took a more keen interest in their education (in truth, like most things I went “all-in geek” trying to figure out how to give them a love of learning), I began to have talks with my Mom. Although we both possess a certain kind of “energy” (arguably un-diagnosed hyperactivity disorder) that keeps us from sitting still long….we occasionally talk about development and education and how much power sits at the feet of the teacher/coach. They’re good talks which often end up with her shaking her head, asking why I didn’t want to become an educator – that is, until we try to imagine what me in the midst of a parent-teacher conference with a “helicopter parent” might look like….at least it always ends up with a good laugh. There were changes in the way bodies moved. A group of little ones began to make connections about motor efficiency. 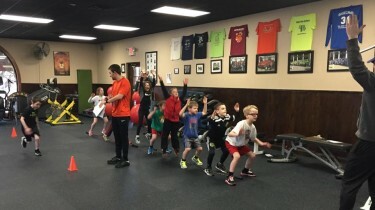 Imagine the possibilities: What if, beyond gym class, every child had the chance to move well….to learn to leverage efficient movement for greater returns in their area of interest – Not only athletes. Musicians might be able to support their instruments better or longer. Artists might hold their concentration longer….and the list goes on. Imagine the possibilities – I know I am. @mikeeisenhart Love this! I am definitely going to pick your brain and figure out how to do it our here! @mikeeisenhart @brookemcintosh This right here!